Died: 16th September 1916; age 23; KiA. Date of Entry Therein: 17th January 1915 – France. 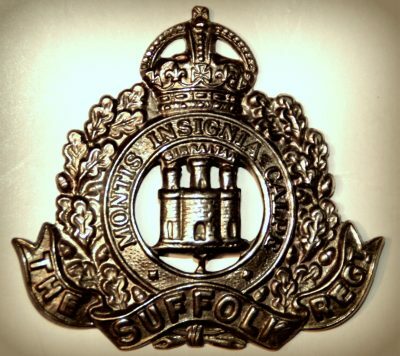 Regiment: Suffolk Regiment, 9th Battalion. Relatives Notified & Address: Son of Joseph & Clara Dawson, of 5, Mill Street, West Dewsbury, Yorkshire. 1901 23, Cauldwell Avenue, Ipswich. Reginald was 8 years old and living with his parents & siblings. Joseph Dawson, 33, a Rag Merchants Manager, born Dewsbury, Yorkshire. Clara Dawson (nee Firth), 34, born Dewsbury. Edith Ellen Dawson, 10, born Dewsbury. Florence Dawson, 6, born Ipswich. Arthur Dawson, 4, born Ipswich. Mabel Dawson, 3, born Ipswich. Dorothy Dawson, 2, born Ipswich. Reginald was 19 years old, a Soldier ranked Private in the 2nd Battalion, Suffolk Regiment. Following an attack on the 13th the 9th Battalion under heavy machine gun fire in the “Quadrilateral” sector took on a German outpost gaining 400 yards of open ground, with no further forward movement dug in. on the 15th the offensive resumed after 3 days of heavy bombardment. During the battle tanks were used. The 9th Battalion moved forward on the 16th in support of the 9th Norfolk Regiment zero hour at 06:20 advancing an hour and a half later under heavy machine gun fire making it difficult to make any headway. At 08:30 a.m. Lieut.-Colonel Mack the commanding officer moved his headquarters to the front-line trench, while observing the attack was hit by machine gun fire and killed passing the command to his Adjutant. C.Allerton. The attack then stalled and the men dug in under now heavy German artillery. 12 officers were killed or wounded 35 ranks killed and 93 wounded. Over all the division for this battle took upwards of 3500 casualties.